scientific calculator for IBM and compatible computer systems. the LS-1.00 Plus, Scientific Calculator. in whole, except as provided in the License in the following pages. LSRGCALC.EXE is Copyright (c) 1990 by Lawrence Stone Research Group. LSRGCALC is not, nor has ever been, public domain or free software. and read by more than one person at the same time. use past this period requires registration. reason whatsoever without a license from LSRGroup. without written permission from LSRGroup. fee to access the BBS is ok). selves and LSRGCALC users from unscrupulous individuals. the calculator from memory without having to first pop it up. Hot Key configurations are available for an additional $5 US. able. Call or write LSRGroup for quantity discount pricing. stating your cost and duration of agreement. Note: All prices and discounts are subject to change without notice. Discounts apply only to separate orders, they are not cumulative. To place an order, please use the order form at the end of this manual. All orders must include check, money order, or warrant. - seventy two "buttons" provide ninety two functions. of mouse, scroll and immediate key control. calculator or the "End" key to entirely remove it from memory. - five hundred element statistical array! - factorials for any real number (whole integer) from 1 to 170.
define the range for the random number), "Exp Distributed"
keystroke in a similar manner as a desk-top adding machine. active path were the calculator "popped up". minutes, and seconds from a time of day. fixed decimals from zero to 15 places. Log e button to compute the log of a complex number. complex numbers or complex roots of complex numbers. to powers of ten with the "E" key). eight pending parenthesis operations at any one time. of -1.79 x 10^308 to +1.79 x 10^308. or any binary from 1000000000000000 to 0111111111111111.
versatility, functionality and blazing speed. into your briefcase where it belongs. - IBM PC, XT, AT, PS/2, or close compatible. - PC/MS DOS version 3.0 or newer. - 80 column monitor in 80 x 25, 80 x 43 or 80 x 50 text mode. LSRGCALC will refuse to "pop up" over a graphics screen mode. 162,000 bytes if you are not using the DISK option). as RAM resident (or as a "normal", non-resident program). in DOS, then all 204,000 bytes will remain in DOS. 4.0 or newer. LIM EMS is highly desirable but not necessary. MOUSE.COM - Microsoft mouse driver. REMOVE.COM - Registered versions of the calculator only. automatically removed by LSRGCALC when you "END"
and write two "C1" files. hard drive. Create a free directory for LSRGCALC and its files. program. That is to say, when you exit the program with the "End"
any other program that may need it. of DOS memory is freed for use by other programs. your system's memory with the "End" button, the last two "C1"
to un-install the calculator directly from the DOS prompt). memory available for other programs to use. "LSRGCALC is Loaded into Memory and is Going to Sleep." "Use + Key Combination to Awaken." calculator will immediately "pop up" over the current program. green cursor at the upper-left most corner of the monitor. "LSRGCALC Already Installed in Memory!" copies of the calculator, from within one computer system. press it down. Use your mouse as an extension of your finger. try loading MOUSE.COM supplied with this program. Plus Scientific Calculator is almost zero." Up Arrow: Moves the highlight up one button at a time. on the same column of buttons. Down Arrow: Moves the highlight down one button at a time. Right Arrow: Moves the highlight right one button at a time. the corresponding row's left-most button. Left Arrow: Moves the highlight left one button at a time. the column. Does not wrap. of the column. Does not wrap. move the highlight to the far left. working with. The Home key will not wrap. move the highlight to the far right. working with. The End key will not wrap. slow down when you "pop down" the calculator. of the keys on your computer's keyboard. controls movement of the highlight with appropriate scroll keys. not the Enter key - your Enter key only actuates the "=" button. spacebar key to actuate any other button while highlighted. The spacebar actuates any button currently highlighted. 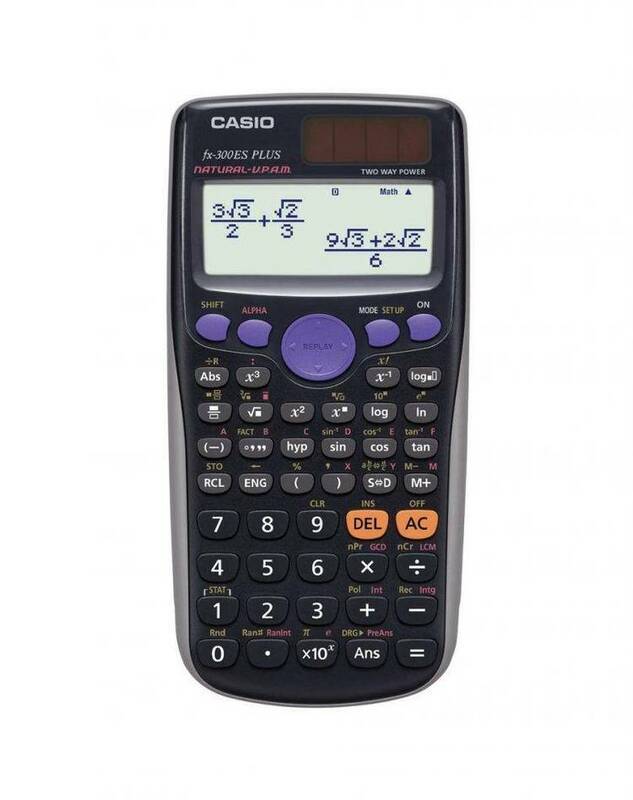 Calculator will make use of your computer's backspace key. digit of the number shown in the Primary Display Window. quired by any Immediate Function button. only delete the right-most digits of the imaginary component. to exit the Look Up Table. can handle that one. But, how do we display 4 to the power of 16? for the square root is easy but how about the cubed root? the nth root, and the reciprocal of n, respectively. 3 + 7 - 2 x 24 12 = ? There is only one correct answer, and the answer is 6, not 16.
the above calculation and it printed out 16, not 6 as you say." the result of each previous operation applied to the next subset. that answer is 6, due to the rules of algebraic operations. it applies each operator to the result of the previous operation. operators and numbers that have "priority". define which operations are to be performed ahead of the others. ority of operations which produced a radically different result. braic operations - parenthesis are of the highest priority. by displaying (1) for one pending operation, (2) for two, etc. (a + 1)(b - 1) is not valid. Dec, Float, Oct, Hex, n!, Fix, or, any Log button. Certain Immediate Functions will require additional keystrokes. the power button, n^ which is an Immediate Function. of mathematics is, "there is more than one way to skin the cat"
(maybe you have to be a mathematician to appreciate the beauty). Below are a few Laws of Exponents you may find useful. does not need to be enclosed within it's own set of parenthesis. the 2 button and then press the equal button). function button, ARC, and their hyperbolic function button, HYP. LS-1.00 Plus Scientific Calculator defaults to the degree mode. mode, such as, inverse hyperbolic functions. before or after the computation. while performing inverse and/or hyperbolic computations. been entered and you are now entering the imaginary component. enter the imaginary component of the number. range will be automatically displayed in scientific notation. Use the n^ button to raise a complex number to a complex value. scientific notation. Use it after the mantissa has been entered. power, use the n^ button. inform you that the calculator is awaiting another complex number. Enter the complex number and press the equal button. pi = 3. The button is not operative while in binary mode. (you cannot compute a logarithm to the base of a negative number). number will be (-3.45E-12 -5.4E-8i). logarithm computations: Log base 10, Log base e, and Log base n.
Logarithm functions act immediately upon the displayed number. base e, or use it to compute the log of a complex number. equal button or another operation button to continue. mation pertaining to Angular Modes and Trigometric buttons. Indicator Window will display the words, "Deg" and "Float". "Fix". You cannot use decimal operations in the binary mode. in the octal number mode. will display the words, "Deg" and either "Float" or "Fix". the Operations Indicator Window will display the words, "Hex"
bers in the hexidecimal number mode. Operations Indicator Window will display the word, "Fix". (-3.40E+38 -3.40E+38i) to a high of (3.40E+38 +3.40E+38i). digits, complex numbers are displayed without parenthesis. Indicator Window will display the words, "Complex" and "Float". number mode and allow the use of all statistical buttons. Har , and Geo . them in the appropriate places. approximate number of years, months and days. full month name, day and year; e.g., "Wed August 15, 1990". reliable from 01/01/1901 through 12/31/2099. Primary Display Window in the format, hh:mm:ss. mode has first been selected. deviations, and the third press to cycle the + button off. array then the options to delete are inoperative. to the statistical array, press the n button THREE more times. The statistical array can accept up to 500 numbers. more times - the Indicator Window will display normal indicators. spacebar (or click with the mouse). and press the equal button or any operation button. randoms, Exp Distributed randoms, and Normal Curve randoms. again to turn off the random generator. then press the equal button. number with an exponential distribution based upon the mean. calculator's mean buttons, such as the Ari button. calculator will display, "sd =" in the Primary Display Window. calculator's + button's standard deviation function. each digit within the random is created through a "shuffle"
never run out of random numbers! entered into the statistical array. 4.10 for information regarding how to clear memory storage. button will terminate the program and remove it from memory. to terminate, display a message, "Go to the DOS Command Line. any RAM resident program from within another application! removing ANY memory resident program is: LAST IN - FIRST OUT. remove the calculator from memory directly from the DOS prompt. The Stuff button stuffs the displayed number into the keyboard. the number because the keyboard buffer can only hold 16 digits. of the log, the message states, "*** Bottom of History Log ***"
of the History Log, returning you to normal calculator operation. "Scroll: <+> <-> Select: <=>". a^(b function c) is invalid! scroll a full page at a time. full page at a time. To append (or create a new) lookup tables is quite simple. on the same drive and same path as LSRGCALC.EXE. be simply ignored by the calculator. - Each line must end with a carriage return. will simply be ignored by the calculator. characters whose numbers are less than ASCII 32. ASCII characters between 126 and 255 are permissible. , , , , , , , , , , , etc. US, and list at least five key combinations desired on the back of this form. Where did you get the LSRGCALC calculator from (check one - fill in line)?